This light, flirty dress will be your favorite look this summer! The Country Whimsy Leather Belted Dress in Pink has adjustable leather straps, as well as an included leather belt. Beneath the belt is an elastic waist that will create a stunning waistline and be sure to flatter. 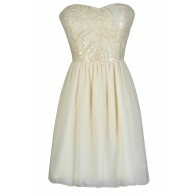 Light petals of ivory chiffon adorn the bodice and add interest to this already eye catching dress. The light chiffon material has a subtle metallic sparkle that will catch the light beautifully. To add to the country appeal, pair this dress with cowboy boots for a chic cowgirl look. If you want to dress it up a bit, it would look great paired with cognac or ivory pumps or strappy sandals. It\'s perfect for all of your summer parties, or even a date with someone special! Also available in grey. Fully lined. 100% polyester. Dry clean only. You have added Country Whimsy Leather Belted Dress In Pink into Wishlist. You have added Country Whimsy Leather Belted Dress In Pink for Stock Notification. You have set Country Whimsy Leather Belted Dress In Pink as a loved product. You have removed Country Whimsy Leather Belted Dress In Pink as a loved product.